Shot with a Canon 5dII, 24-105 f4/L, and 50mm f1.4. Both shots were significantly underexposed. I immediately had the idea of putting my keyboard in coffee when I saw this challenge. The white cup will hide details around the unexposed black coffee, and I happen to be thinking about coffee through the majority of the day while staring at my computer's keyboard. 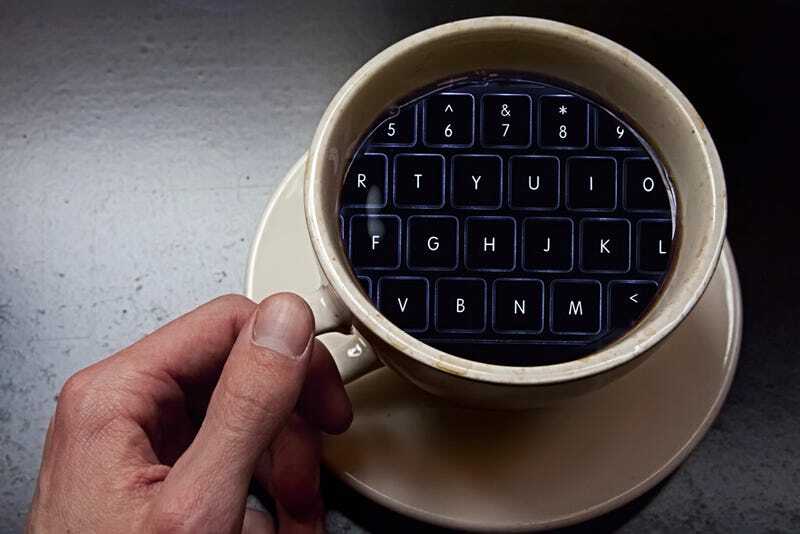 In order to place the shot of my keyboard only in the coffee, I cut a circle through several pieces of paper and put that over my Macbook's back-lit keyboard. I ended up with a shot of the illuminated keys that matched the shape of my coffee quite well. I lined them up in photoshop, blended them with the 'screen' mode (thank you rootyb), and merged. No masks or other digital effects were needed or used to create the final product. Taken with a tripod mounted Canon 60D, 1/125th second exposure at f/7.1, ISO 100. Low-speed continuous shooting mode, manual white balance. This is me juggling some brightly colored juggling frogs in the backyard. I was going for the multi-armed Indian god look. Well, just the multi-arm part. Took the best 4 pictures out of eleven taken, layered them in Photoshop, set blending mode to linear dodge, used "curves" to darken, and did a little selective erasing of my head in two exposures to prevent too much blurring there. Hi, This was a real simple shot when I was playing with my canon eos 550d(T2i) and Canon spedlite 430 exii. I was using my Tamron 70-300mm lens at the time as well. All I did was position my camera on my tripod and then set the shutter speed to 30 seconds, aperture to 36 and iso to 100, turned the lights out and then opened the shutter, moved the first item into place, fired the flat at 1/64 power. Then moved the second item into position and fired the flash again. Panasonic DMC-TS2 28mm Leica (attached) Base Layer- Effects: Psuedo-HDR 1/1000 sec. ISO-80 f/3.3 Second Layer- Effects: Sepia 1/250 sec. ISO-400 f/3.3 I took a trip with a few friend to place called the "Blue Room" on the island of Curacao, which is a place where you can go cliff diving and offers killer snorkeling (including an underwater cave which it is named after). I was taking pictures of people in the air as they were diving off the cliffs and I also took a few of the cliffs themselves and I thought mixing the different perspectives and colors would make for a really cool Pop Art type picture for this week's photo contest. I hope you like it! This affect is easy to do in Photoshop, and a lot easier when the camera has the option. The Olympus EPl1 has it. The only problem that I had was taking a picture outside, it was really trying to rain. The picture that I took inside were dumb looking. I tried for thirty minutes to get a photo of me high fiveing myself in one photo. I just couldn't get it to come out the way I had imaged in my head. I then just took two photos of an arangement on our kitchen table at different angles and merged the two together in post production. I actually liked the final image, but felt like I had cheated a little. As soon as I read this weeks challenge, I knew what I wanted to do. Saturday night I went up to a local building and took pictures of my car. I took a few with the hood up and down, and had everything planned out. While I was taking pictures, a sheriff pulls up and asked me what I was doing while I was looking through the viewfinder of my camera, I told him I was taking pictures and he kicked me out. I was able to get plenty of shots done though, so it didn't matter. Each shot was taken with a 3s exposure and ISO 100 with no flash to keep all the lighting natural. I then took the two images into Photoshop, set the image with the hood down as the base image, added the other image on top with a setting of Screen. The image produced was just how I wanted it, nothing extra had to be done, and you can see the outline of the hood up. I loved that it was a film-oriented challenge, so I just had to submit something. I had never actually done double exposures before, but thankfully, I have my camera's original manual (which I consider to be quite the feat, seeing as it's from 1972), which had very helpful instructions. Whenever I can't decide what/where I want to shoot, I go to this abandoned school out by my house. It opened (and closed) in the 80's, and then was owned by a non-profit artist's community for about a decade before they defaulted on the mortgage, and ever since then it's just been boarded up and left to molder. Graffiti and broken glass and weeds everywhere. There's a huge abstract sculpture there that was done by friends of my family, and I just love the contrast between this giant piece of art, and all the junk that surrounds it. Shot with a Honeywell Pentax Spotmatic IIa, with a 50mm, f/1.4 SMC Takumar lens on 400 ASA Kodak Ultra film. One exposure shot at f/9.5 for 1/1000 sec, and one at f/16 fr 1/1000 sec. Hey there Gizmodo! The pictures were taken in front of the Lund University main building during a cold swedish night. Out of the 3 shots, 2 were with the camera on a tripod to capture my friend Maggie on top of the wall and get the foreground nice and bright using a flashgun held in hand and connected by a cable. 1" exposure, ISO 400 F/3.6. Then, the camera was rotated 90 degrees and i positioned Maggie in such manner that this time she will land on the vertical wall, 1/200 sec, ISO 400 F/3.6. The focus points were very helpful when aiming the rotated shot. The pictures were composed inside the camera - Nikon D3100 - itself. This is my first try in the Shooting Challenge . So I understood my camera can take this type of photos very easy, I wanted to try some things, but because of lack of time this is the result one of my friends with billiard balls instead of eyes. The shots are two. I used Nikon D90, Tamron 17-50 f2.8, 1/50, ISO 320. In Northern Michigan it's cold, so cold you swear your fingers will break off while snapping up the beauty, but there is always an endless adventure awaiting, alas we continue on. Taken while roaming the great north with my best buddies, Sunny Rose and Mook. (Mook appears in photo.) This photo was taken using an iPhone 4 and the Hippstamatic application. The film used was the Clauch 72 Monochrome film, and the lens was Salvador 84. "It looks like a nice place?" It amazes me how everything has to come with warning labels, even beaches. Now, to enjoy a day at the beach, you have to worry about rip currents, submerged rocks and even tsunami. Shot with Lomo's "Sprocket Rocket", this is the Bob Kerry pedestrian bridge from Omaha to Council Bluffs. Shot on Saturday February 12, this was the first semi warm day (in the 40's after being below zero most of the week) and many people took advantage of the weather to walk the bridge. Since the "Sprocket Rocket" has not light meter and shoots at 1/100th of a second or bulb, the picture came out a bit over exposed, but bringing it back in Photoshop gave it an interesting look. Film was expired 200 Fuji. My entry for the Double Exposure Shooting Challenge is attached, description is below. Thanks! Roots in the community. This shot was taken in the camera - not layered in photoshop. My DSLR happened to have a multiple exposure mode which has the same effect of film: exposed white areas in the first shot can't be re-exposed with darker color from the second shot. For this shot, I walked around picking weeds for their roots, then posed them upside down. I took the shot of the downtown skyline then repositioned, turned the camera upside down, and took the second photo of the roots against the sky. Yes, I edited color and added a paper texture overlay afterward. I thought it looked neat, even if a bit over the top. Shots were taken with a Nikon D90 and 18-200mm lens @ f9, 1/2000, ISO 200. I shot this photos using a canon eos 7d with an asahi pentax 50mm mf lens mounted on the body.The aperture was f2,the shutter speed 1/125 and the iso 1000.I used a tripod to mount my camera and a modified old table lamp to produce some nice light.The item on the photo is an old clockwork train which i have since i was a kid.i placed the train on a mirror in order to produce nice and clean mirroring. For this week's challenge I left it to the last minute, oh who am I kidding I always do, nevertheless the Nikon D90 has a multiple exposure setting built in to the camera. My image is three different pics stiched together in camera. Shot with a Tokina 116 (11-16mm) at 6 sec @ f18 each pic. The "Stars" are caused by the apature being very small and the 9 blades of the lens apature. The Story: I looked at the contest for this week and was quite perplexed since I shoot with a digital camera. I was kinda bummed about having to fake the look of a double exposure during post processing. While thinking about buying a disposable film camera to perform this task I sat down to watch an episode of Top Gear when I had an epiphany. I decided I would fake a double exposure by trying and capturing a screen grab while transitioning from one scene to another on my monitor, this proved to be easier than I thought and came out pretty good. I did not do any post processing on this photo and think that it is a pretty cool, definitely the best out of the bunch I took. This picture was taken with a Holga 120 fitted with a 35mm film. Expired 35mm 200 speed. The barrels in the photo are of a fountain/permanent art installation at a nearby mall called the Lab in Costa Mesa, CA. The other shot is of train tracks near my house. This shots were taken using a Canon T2i with a 28-135 f/3.5-5.6 at 200 iso. I used the screen method mentioned in some of the comments for the shooting challenge but I dropped the opacity of the train tracks layer to 90% in order to make the barrels come through better. Pretty simple, Nikon D3100, 18-55mm lens, my bathroom, two pictures, one on top of the other with about a 75% opacity. I had several ideas for this contest, but this seemed the best idea since it was so simple but it came out the best. I took the photo one photo at a low f stop f/3.5 at 1/25 shutter speed handheld. The second shot was also f/3.5 but 1/100 handheld. Both shots on my Canon Rebel XSi. There wasn't much post process, I just merged the two photos and made the candlelight photo a low opacity. This is a quick shot of some yellow tulips and an orchid from my kitchen. The flowers were about 5 feet apart, using the low-light long exposure trick for DSLRs to achieve the double exposure, i fired my flash moved with haste to the other flowers and fired the flash a second time. It took a few tries to get the light and the focus as good as possible but i like the effect. Canon Rebel XSi, 50mm f/1.8 and Flash. I went to Alviso to with my friend for a photography adventure. I took some underexposed shots of various "textures" specifically for this shooting challenge. After sunset my buddy pulled a pair of jumping stilts out of his trunk and asked me to take some action shots. This was the result. Both shots taken with my Canon 60D and 24-70mm f/2.8L lens. Jumping shot: 38mm, f/2.8, 1/60s, ISO 1600 Noise reduction, curve adjust, saturation boost in Canon software. Shoe prints in the dirt: 38mm, f/8, 1/1250s, ISO 200 Sharpening and curve adjust in Canon software. The images were blended in Photoshop using "Screen" mode. Maple syrup season, one of the first signs of spring, is here and this photo is of a few sap buckets some of my students hung yesterday at our school. We have worked the last three years with a local restored farm that gathers sap from many different locations in town. In about a month they will bring a portable evaporator to the farm and boil down whatever sap we gather into maple syrup. Most of the syrup will be sold to help support the farm. In the image of the tap you can see sap already beginning to flow. Forty gallons of sap equals one gallon of syrup. The images were shot with a Nikon D40x on auto using an 18-135mm lens. The three images were manipulated using Photoshop Elements 5.0. Image one: Bucket with dripping tap ISO 250 Shutter 1/125 f 5.6 Image two: trees ISO 100 Shutter 1/200 f. 7.1 Image three: Trees with buckets ISO 100 Shutter 1/200 f. 7.1 Thank you for looking. At first I planned on exposing the horizontal perspective of an object using double exposure but I was at a loss on what object that might be LOL. So instead I took pictures of an escalator both front and back (my mind was still set on doing that first idea) though not all 360 of it. As a finishing touch, I had my mom (for she was with me that day. i know right) fit one shoe and took an attempt to align the framing with either of my two escalator pictures. In photoshop, I use 75% opacity on two images and experimented with blending modes (I used overlay and lighten, I think), I didn't used masking, it defeats the purpose IMO. Used my Nikon D5000 with 50mm f/1.8 set at f/2.8 Aperture Priority at iso 1600 to capture the three photos. A total of 3 shots composed the image: the Duvel glass, the purple and yellow flowers as background and the little orange flowers in the glass that are ghost-like (I really liked this effect, although I don't fully understand how it got so). The flowers were really small, about 2 inches so i really had to get close and low to shot it correctly. The editing has been done in CS4, which was the biggest challenge for me. Shot with a Nikon D3100 at 18mm, f/3.5 ISO 200.